These regulators are the same size as the D24V22F12 and they have similar current capabilities and input voltage ranges, but they do not have the same pinout and they are based on a different internal design, so there are fundamental differences in operation. 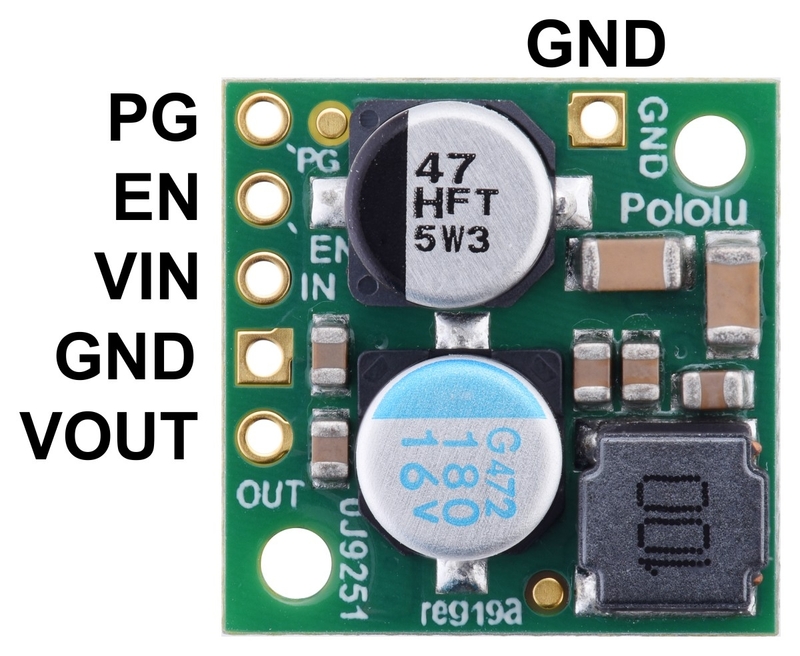 This buck regulator has five main connection points for five different electrical nodes: power good (PG), enable (EN), input voltage (VIN), ground (GND), and output voltage (VOUT). The board also features a second ground connection point off the main row of connections that might be convenient for applications where you are soldering wires directly to the board rather than using it in a breadboard. The input voltage, VIN, powers the regulator. Voltages up to 36 V can be applied to VIN. The effective lower limit of VIN is 12 V plus the regulator’s dropout voltage, which varies approximately linearly with the load (see below for a graph of dropout voltages as a function of the load). The output voltage, VOUT, is fixed at 12 V.
The regulator is enabled by default: a 270 kΩ pull-up resistor on the board connects the EN pin to reverse-protected VIN. 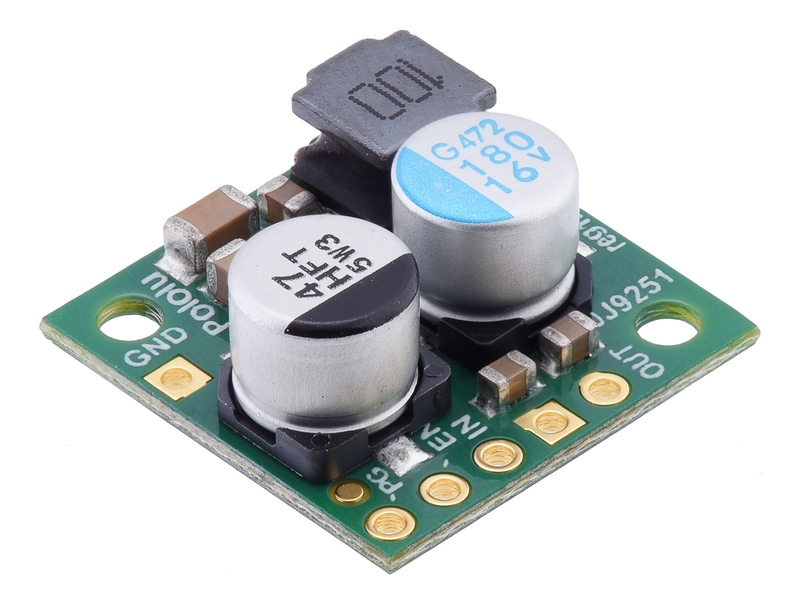 The EN pin can be driven low (under 1 V) to put the board into a low-power state. The quiescent current draw in this sleep mode is dominated by the current in the pull-up resistor from EN to VIN and by the reverse-voltage protection circuit, which altogether will draw between 5 µA and 10 µA per volt on VIN when EN is held low (~50 μA at 13 V in to ~350 μA at 36 V in). If you do not need this feature, you should leave the EN pin disconnected. 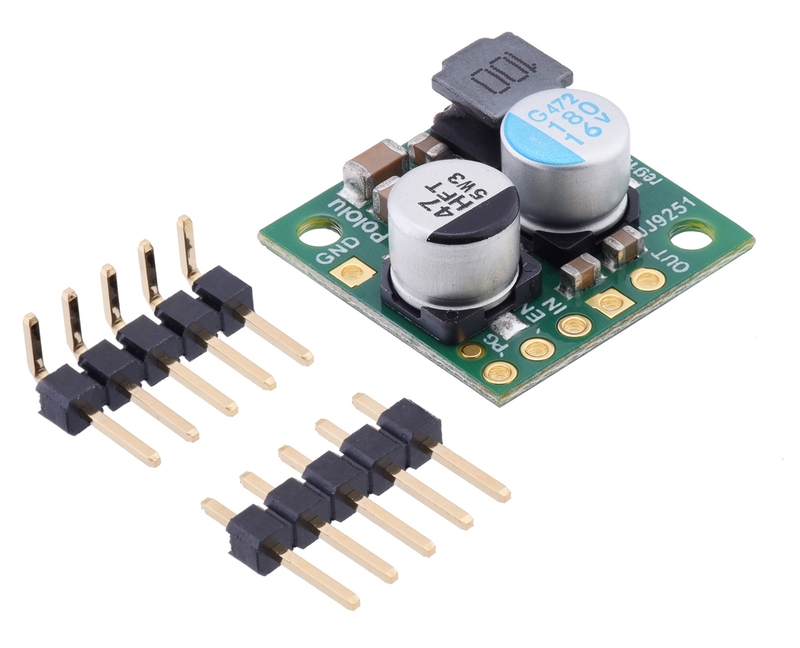 The “power good” indicator, PG, is an open-drain output that goes low when the regulator’s output voltage falls below around 10 V and becomes high-impedance when the output voltage rises above around 11 V. An external pull-up resistor is required to use this pin. 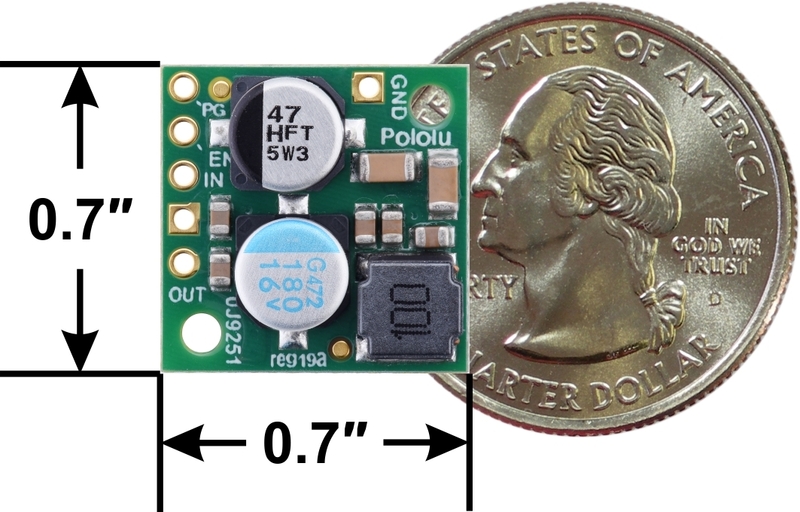 Pololu 12V, 2.2A Step-Down Voltage Regulator D24V22F12 with included hardware. Pololu 12V, 2.2A Step-Down Voltage Regulator D24V22F12, bottom view. Pololu 12V, 2.2A Step-Down Voltage Regulator D24V22F12, side view. The maximum achievable continuous output current is typically around 2.2 A, but this depends on many factors, including the ambient temperature, air flow, heat sinking, and the input and output voltage. The dropout voltage of a step-down regulator is the minimum amount by which the input voltage must exceed the regulator’s target output voltage in order to ensure the target output can be achieved. For example, if a 12 V regulator has a 1 V dropout voltage, the input must be at least 13 V to ensure the output is the full 12 V. As shown in the graph below, the dropout voltage increases approximately linearly as the output current increases.